If you’re new to leveraged trading or just discovering the markets for the first time, you probably will have asked yourself either “what are CFDs?” or “what is CFD trading?” Instead of googling “CFD trading meaning” you can learn everything you need to know here. Learn to trade CFD Trading Guide What is CFD trading? CFD trading meaning: What is a contract for difference? A contract for difference (CFD) is a popular type of derivative that allows you to trade on margin, providing you with greater exposure to the financial markets. CFDs are a type of derivative, meaning you do not buy the underlying asset itself. Instead, you buy or sell units for a given financial instrument depending on whether you think the underlying price will rise or fall. A CFD is a contract between a broker and a trader who agree to exchange the difference in value of an underlying security between the beginning and the end of the contract. CFDs and futures are both derivatives, so what is the difference? A futures contract (or simply ‘futures’) and a contract for difference are both derivative products. When you purchase a CFD, you are buying a set number of contacts on a market if you are expecting that market to appreciate and selling a set number if you expect the market to fall. The change in the value of the position you take is reflected in the movements of the underlying market. With CFD trading, you can close your position at any time when the market is open. Futures, on the other hand, are contracts that mean you are agreeing to buy a financial instrument at a set point in the future at a predetermined price. Unlike CFD trading, you have a set date and price for this transaction, which means closing your position could be costly. The value of a futures contract depends on both the current movements in the underlying market and the market sentiment about the future price of an asset. When you are trading CFDs, you hold a leveraged position, which means you gain greater exposure to the market with your initial capital. In other words, you only put down a deposit of the value of your trade and borrow the remainder from your broker. Leveraged trading is also referred to as trading on margin. This is because the funds required to open and maintain a position – known as the margin – are only a faction of the total trade size. There are two types of margin you should be familiar with when trading CFDs. There is the deposit margin, which is the amount required to open a position, and the maintenance margin, which may be required if your trade starts making losses that are not covered by the deposit margin or additional funds held in your account. CFD trading allows you to profit from both a rising or falling market. You can make money on an appreciating or depreciating asset because the contract offers both buy and sell options. This means you can use CFDs to mimic investing in an asset by opening a long (buy) position; this is known as buying or ‘going long’. Conversely, you can open a short (sell) position if you think the price will decrease, which is essentially ‘betting’ against the market. This is also known as selling or ‘going short’. Hedging in trading is a crucial risk management strategy. A hedge is an investment position that is opened in order to offset potential losses of another investment. Think of hedging as an insurance on an investment: if an investor is hedged in the event of a sudden price reversal, then the ramifications are dampened. 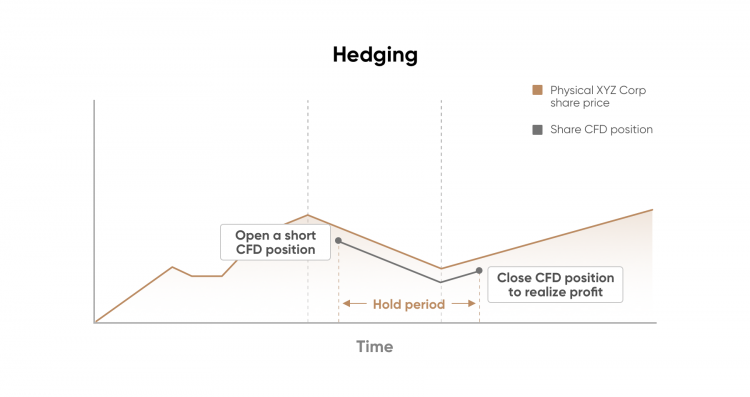 Simply put, a hedge is a risk management technique used to reduce any substantial losses. You hedge to protect your profit, especially in times of uncertainty. CFDs provide an excellent insurance opportunity to hedge your existing portfolio due to the fact that you can sell short by speculating on a price downtrend. Say, for example, that you have an existing portfolio of blue chip shares. You want to them hold for the long term, but you feel as if the market is about to witness a short dip, and you are concerned about how this will affect the value of your portfolio. With leveraged trading, you can short-sell this market in order to hedge against this possibility. Then, if the market slides, what you lose on your portfolio can be offset by the gain from your short hedge using CFDs. If the market rises, then you will lose on your hedge but gain on your portfolio. What can you trade with a CFD? When CFD trading, you can open positions on a variety of different asset classes including shares, indices, currencies, commodities and cryptocurrencies – all within one single platform. A trader can enter the stock market without having to deal directly with share purchases, providing greater liquidity and easier execution. This has the added benefit of being able to profit in a falling market by short selling. Trading CFDs is one of the very few ways to gain access to the indices market. CFDs on indices mirror the composition of a certain index. The FX market is suited to CFDs and leveraged trading due to the relatively small price movements that occur in these markets. CFDs provide a simpler and more cost effective way to trade commodities compared to futures. Cryptocurrencies have a tendency to be highly volatile, providing excellent opportunities to trade CFDs on them given the leverage. Remember to employ risk management techniques when trading at all times and be even more cautious of assets that have a history of being highly volatile like cryptocurrencies. CFDs are exempt from stamp duty as they are a derivative product. You would save the 0.5% stamp duty on the buy transaction costs. CFDs provide access to various financial markets in which it might otherwise be difficult to gain exposure (e.g. overseas or emerging markets). CFDs also allow investors to trade on the price movements of stocks, commodities, indices, currencies and cryptocurrencies through one single platform here at Capital.com, saving both time and money. Trading on margin allows you to increase your market exposure, and consequently, your investment capacity with a smaller initial deposit. It is crucial to remember that with higher potential returns, there is also increased risk. When trading CFDs, you have the ability to short sell a market. This is essentially ‘betting’ against the market, speculating on the depreciation of an asset. CFDs allow you to take both long or short positions with equal ease. Conversely, short selling of traditional shares often comes with added broker fees. You can enter the CFD market by registering with Capital.com and making a deposit. CFDs do not call for upfront financial restrictions, unlike traditional share dealing. CFD trading allows investors to access the market directly without the need to call in a stockbroker. This is a quicker medium to trading and is an accessible way for those new to trading to enter the market. Why trade CFDs with Capital.com? Advanced AI technology at its core:A Facebook-like News Feed provides users with personalised and unique content depending on their preferences. If a trader makes decisions based on biases, the innovative News Feed offers a range of materials to put him back on the right track. The neural network analyses in-app behaviour and recommends videos, articles, news to polish your investment strategy. Trading on margin:Providing trading on margin (up to 200:1 leverage), Capital.com gives you access to financial markets with the help of CFDs. Trading the difference:When trading CFDs, you don’t buy the underlying asset itself, meaning you are not tied to it. You only speculate on the rise or fall of the asset price. When CFD trading you employ the same strategies as you would in traditional markets, with the exception that you can short-sell with CFDs. 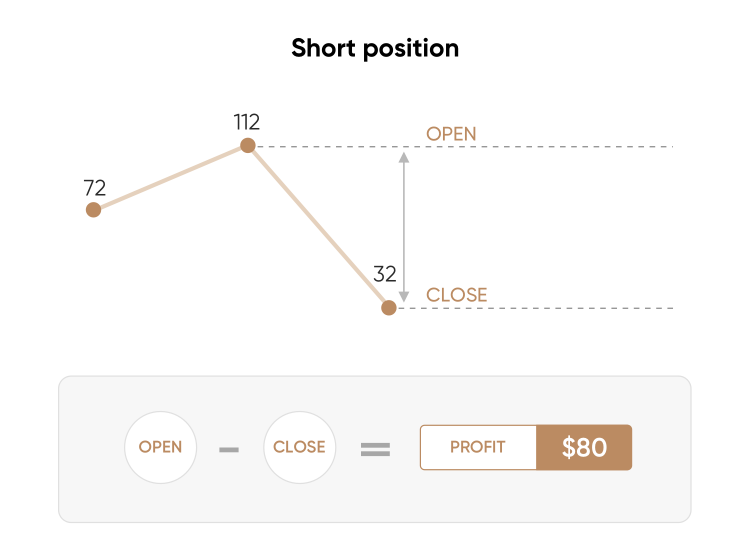 A CFD investor can go short or long, set stop and limit losses and apply trading scenarios that align with their objectives. All-round trading analysis:The browser-based platform allows traders to shape their own market analysis and forecasts with sleek technical indicators. Capital.com provides live market updates and various chart formats, available on desktop, iOS, and Android. Focus on safety:Capital.com puts a special emphasis on safety. Licensed by the FCA and CySEC, it complies with all regulations and ensures that its clients’ data security comes first. The company allows to withdraw money 24/7 and keeps traders’ funds across segregated bank accounts. Whether you are new to trading or an experienced professional CFD trading appeals to all. Beginners enjoy the exposure offered, by CFDs, providing greater access for a smaller amount of given capital. More experienced traders are attracted to the possibility of hedging their existing portfolio and diversifying their portfolio using CFDs. What are the risks of CFD trading? CFDs are complex instruments and trading them entails a high degree of risk. The value of a trade can rise as well as fall, so you may suffer losses if the market moves against your expectations. Moreover, leveraged trading can amplify wins and losses, so there is a high risk of losing money rapidly.